The departure of key veteran DBs such as Ifo Ekpre-Olomu and Troy Hill have been making Duck fans wonder how next year’s DB group will perform. During spring ball, we learned that the Oregon coaching staff decided to switch up true sophomore Charles Nelson‘s role from RB to DB to bring more competition to the squad. 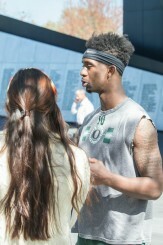 This boost of attention in the Ducks’ secondary should be interesting, as coaches and fans are unsure of which DB will be the best replacement for Ekpre-Olomu and Hill. One individual who is attempting to fill either of those voids is DB Chris Seisay. FishDuck.com sports reporter and writer, Ashley Young, had an opportunity to talk with Seisay after spring practice yesterday morning. When asked about what he’s specifically focusing on to earn himself one of the DB vacancies, Seisay discussed how he’s doing what the coaches want out of him, which is to be “more vocal and confident in my play. They want us to do certain things on defense and I just listen to DP [defensive coordinator Don Pellum] more and do what he tells me.” Seisay hopes his attentiveness will pay off as one of the starting jobs. DB Chris Seisay could serve as a possible leader in the DB group heading into the future. Pellum has expressed how the defense has been developing and making progress since day one. This can be seen in their improvement in coverage, tackling and being more vocal to effectively communicate what the offense is trying to do. Seisay expressed how on scrimmages with the offense, he’s been playing “fast, smart, hard, and confident.” These factors are what the DB group, as well as Oregon’s entire defensive group, are all about: swarming to the ball. “But, the most important factor for me would be the technique.” Seisay added. For his last question, he was asked what two things does he think the DB group needs to accomplish before the end of spring ball. At first, Seisay hesitated, but eventually mentioned how “running to the ball and just making great plays are what we need to work on going forward.” With next week being the last week of spring practices, Seisay, along with the Ducks secondary, will have some time to work on these key factors, which should result in some great plays made during the 2015 Spring Game.